No matter what you are up to, Talixo has the right ride option for the best price. When making a booking you can see and compare all four booking categories at once. Talixo always displays the cheapest offering for each booking class and considers discounts and special promotions, which are dependent on booked route and time and safes you additional money. Discounts can be up to 50% of a normal fare. You decide which offering fits you best. We have everything from value for money until luxurious rides. You need a Taxi quickly or you need a Limousine for yourself or your boss? You get both at Talixo. So you don’t need to keep and handle several different contacts of different providers. You know this situation? You sit in a taxi or limousine and you got an unfriendly driver, who is detouring and has got a very dirty car. At Talixo we proactively monitor the quality of our drivers and cars, so that you arrive at your destination with maximum comfort avoiding bad surprises. At anytime you can easily book taxis and limousines via the Talixo webpage and mobile app. The advantage: Talixo’s Technology facilitates instant booking confirmation of your trip. No need to wait for a booking confirmation any longer. Taxis you can book up to 30 minutes before pickup time and limousines up to 2 hours before. 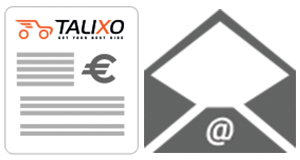 With your Talixo Account you keep always control of your bookings and your costs. At any time you can check your pending future and past rides. Moreover you receive, depending on your preference, either weekly or monthly invoices with all ride details and additional information. This makes it easy for you to expense your bills with your employer or prepare your next tax filing. You don’t need to bring cash or your credit card with you anymore when riding a taxi or limousine. All you need is your mobile phone or your booking confirmation, since Talixo sends you a text message for every ride containing a PIN with which you can authorize the payment through the driver. Talixo offers companies a customized account that helps specifically receptionists, assistants and business travelers to book and expense taxis and limousines.